The famous rice terraces of Batad were one of the most impressive sights I’ve seen during our 5 month trip around the world. Found on Luzon in the Ifugao mountains these ingenious rice terraces are sometimes called the 8th world wonder and rightfully so! The terraces are believed to be over 2000 years old, it’s astonishing the Ifugaos have been able to build them without any (modern) equipment. The best way to truly admire the Batad rice terraces is by going on a multi-day hike. 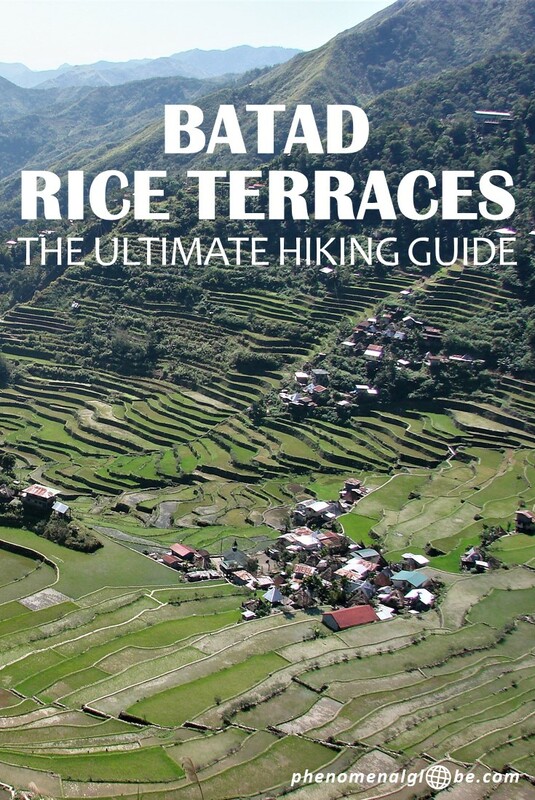 Read everything you need to know about hiking the rice terraces of Batad in this post! How to get to the rice terraces of Batad? There are daily night buses from Manila to Banaue, we booked a trip with Ohayami, this bus leaves at 9pm. I recommend taking a cab to the Ohayami bus terminal, the address is Cor. Fajardo St., Lacson Ave, Sampaloc (Manila). A lot of patience and being ok with not sleeping much that night since you are sitting straight up and the road is very bumpy. But hey, that’s travel;-). We arrived at Banaue bus station early in the morning. Everybody got off the bus and was shuffled into jeepneys. Our jeepney took us to Uyami’s Green View Restaurant where we had breakfast and arranged our hiking tour. 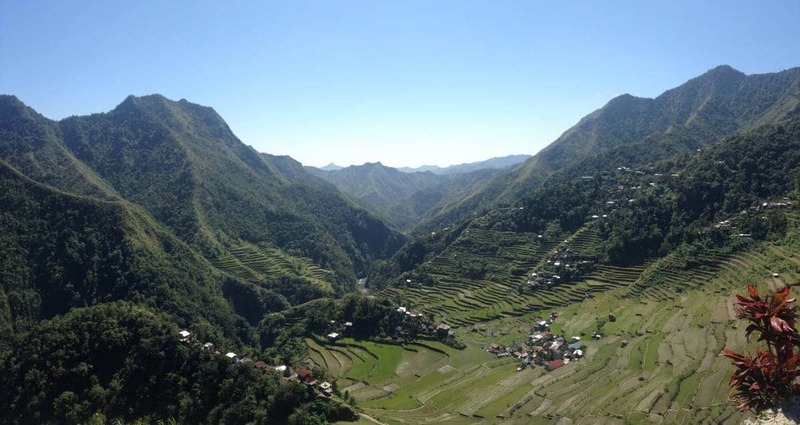 How to organize a hiking tour in Banaue? Arranging a Batad hiking tour is very straightforward. While you can book a hiking tour online before arriving in Banaue, we choose not to do this (we wanted to be flexible about our hiking dates). Instead, we there arranged our tour immediately after arriving in Banaue by night bus. We teamed up with 4 other travelers (who ended up being really good friends) and created our own hiking group. In the restaurant there were many guides offering their services, you can discuss your preferences with them and create a customized hiking tour. 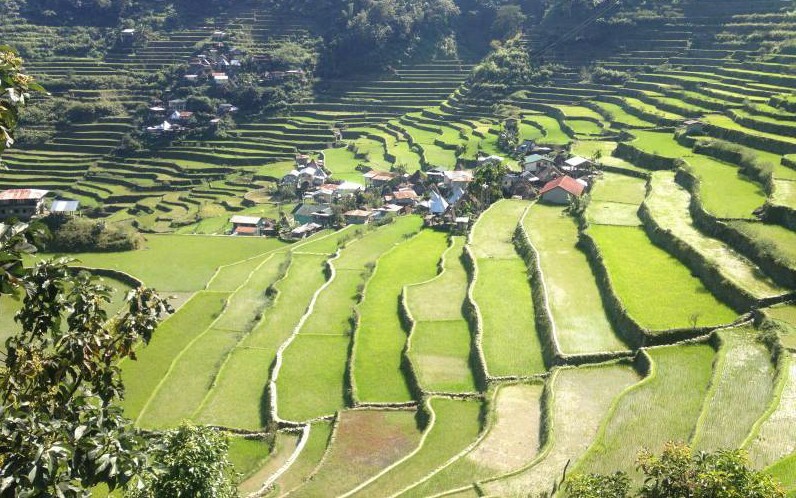 How much does 3 day hike to the rice terraces of Banaue, Cambulo and Batad cost? Prices are always a little tricky in Southeast Asia as they usually depend on your negotiation skills. We did not shop around in Banaue trying to find the cheapest tour, but we did do a bit of bargaining. Ultimately we paid 2120php (€36/$40) per person, our group consisted of 6 people. • Transport from Uyami’s Green View Restaurant to Ohayami night bus terminal. 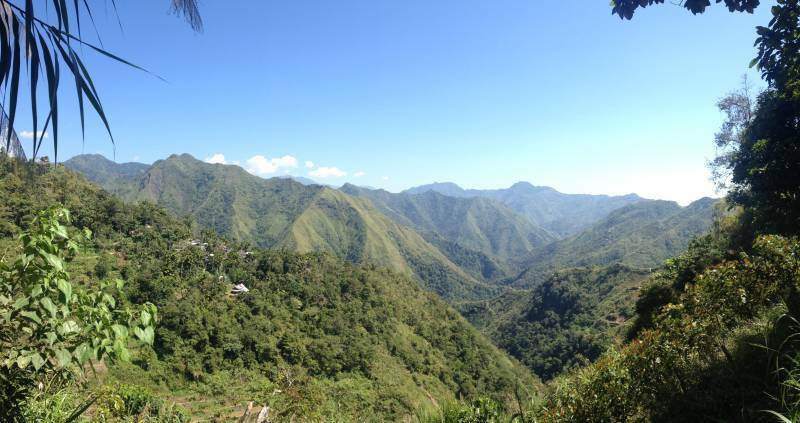 Read more about our journey from Manila to Banaue in this post. Where do you sleep during a multi-day hike through the rice terraces of Batad? During the hike you will stay at small local guesthouses. 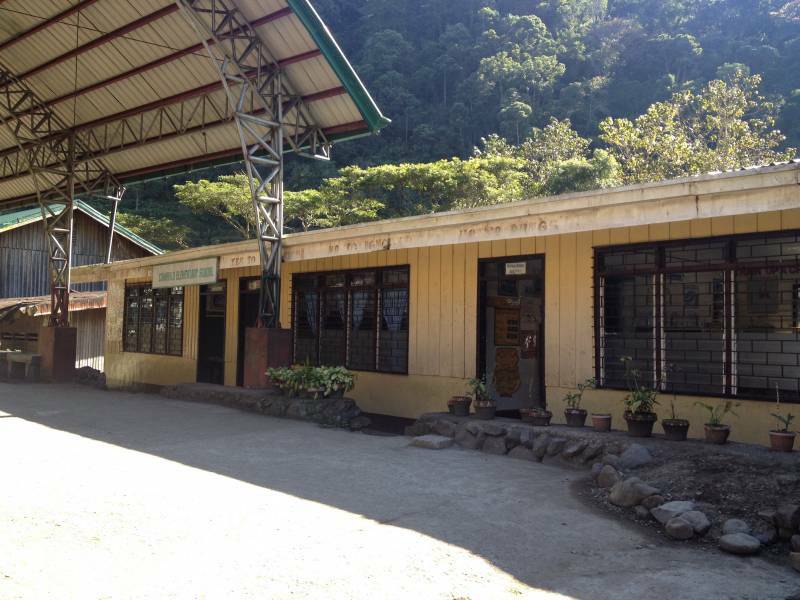 To give you an idea what to expect when you are going to hike in Banaue: accommodation is (very) basic. During our first night in Cambulo there was no shower and only one small toilet with a bucket. Nevertheless, the bed was clean and I slept like a baby because I was completely exhausted after hiking for 6 hours an not sleeping much on the bus from Manila to Banaue. I have thoroughly searched the web, but could not find our Cambulo accommodation online (not surprising, it was a tiny village and a very small guesthouse). In Batad we stayed at the Hillside Inn. This accommodation had a shower (with hot water!) which was shared with two other rooms. The bed was hard but clean and the view from the balcony was breathtaking. Click here for the latest prices of the Hillside Inn. Where do you eat during a multi-day hike through the rice terraces of Batad? You eat at your accommodation, usually food and drinks are not included in the tour price. But with 70php (€1,20/$1,35) for a delicious chocolate banana pancake you don’t hear me complaining. Prepare well for your track and buy enough water and snacks before you leave Banaue. There is little tp nothing available along the trail because everything has to be brought in on foot. Though you can buy new water at the guesthouses, it’s better to bring your own water filter bottle, SteriPen or chloride pills to minimize plastic waste. What to pack for a multi-day hike through the rice terraces of Batad? I selected my gear for our 3 day hike very carefully and only brought the essentials to make everything fit into my day pack. We stored our big backpacks in a hostel in Banaue (in a locked room completely filled with bags). I never worried about stuff getting stolen but I’m not overly attached to stuff so if you have any items you cannot stand losing you may want to bring those with you. Day 1: we arrived in Banaue by night bus at approximately 6 o’clock. It took us a couple of hours to have breakfast, arrange a tour, buy food and drinks for on the trail and get to the start of the trek. We started hiking around 11am and arrived at our accommodation in Cambulo around 6pm. Day 2: we left at 9am and hiked to the Tappiya waterfalls. After a dip into the water and lunch we hiked to Batad where we spent the rest of the afternoon. Day 3: again we left around 9am and hiked for about 3 hours to the end of the trail where a jeepney picked us up and drove back to Banaue. We spent the rest of the day in Banaue and got on the night bus back to Manila at 6:30pm. Below you can find a map with the places mentioned in the post. We trekked with a guide and the track through the terraces is quite difficult to find on your own, I recommend you book a tour. It’s not expensive and you will learn a lot about the history and customs of the local people from your guide. It’s early in the morning and I am still a little dazed from not getting much sleep during the long ride on the night bus from Manila to Banaue. Breakfast and coffee at Uyami’s Green View Restaurant wake me up and after some bargaining with the tour agents we arrange our three day hike. After a short ride in a jeepney up the winding road we arrived at the Banaue rice terraces view point. After taking a couple of pictures we get back into the jeepney which drives us the starting point of the hike. Our guide tells us about today’s hike and our destination of the day. We will walk for about 20 km to the Cambulo, a tiny little village which can only be reached by foot! The path is slippery at some places, so I fall down in the mud every now and then (like everyone in the group except our guide, who is walking in flip flops and doesn’t seem bothered by the mud in the slightest). 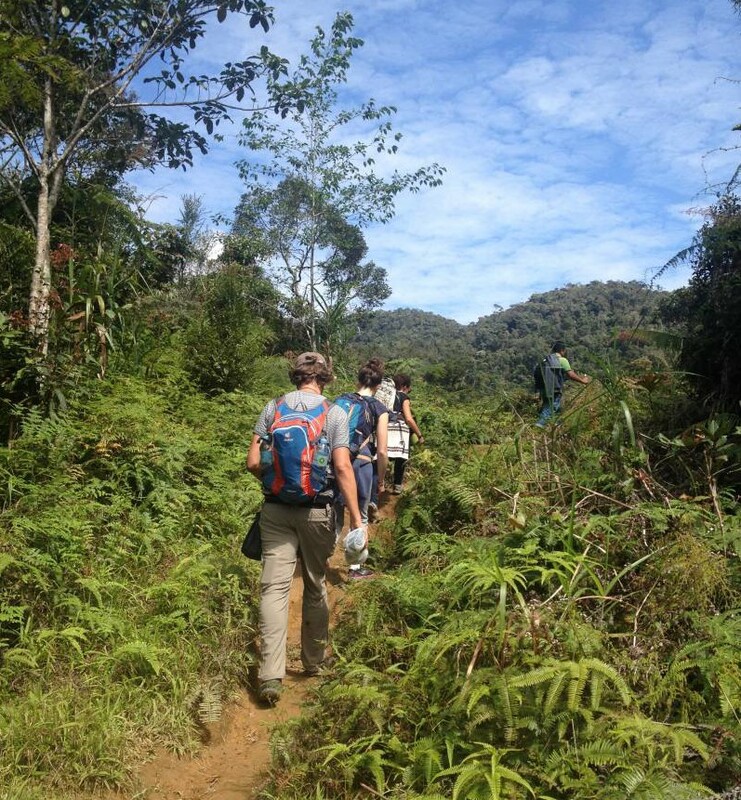 The first part of the hike goes through the jungle, so many plants and trees I have never seen before! So green! So quiet and remote! The second part of the hike goes through the rice terraces, which have very narrow paths so I am being careful not to fall in, or worse, fall off! Amazing that these terraces are so old (they say over 2000 years!). it’s such an inventive system, with the irrigation canals flowing from the top all the way down to the lowest terraces. Really clever! We pass through a village and learn from our guide it’s only since a couple of month this village has electrical power! Before the power line was extended to the village, the locals relied completely on solar power! After seven hours of hiking we arrive in Cambulo, in a basic but clean guesthouse. I am completely exhausted from the hike and all the impressions of the day (and probably also from not sleeping the night before). Barely being able to keep my eyes open I manage to clean up a bit with a bucket of water (no showers here;-) and chew down some food before falling asleep for 12 hours straight. At 9 am sharp we take off for our second day of hiking and I am feeling completely rested and refreshed (cough…muscle ache…cough). We visit Cambulo Elementary school (many of the children have to walk for over an hour to get there!) and talk to the teachers. If you pay a visit to the school of Cambulo, be sure to make a donation. The money will be put to good use! We continue along a trail zigzagging through the rice terraces that I surely wouldn’t have found without our guide. It is a wonderful track, each view is more stunning than the last, the sky is a magnificent blue color, the jungle a gorgeous green, the mountains surrounding us are impressive and I am thoroughly enjoying the moment. After two hours of hiking we arrive at a ridge and get to behold yet another beautiful view: the rice terraces of Batad! These terraces are the most famous ones of the region, because the village center of Batad is located in the middle of the rice fields. But before descending to Batad, we take a ‘small’ detour down some alarmingly steep stairs to a beautiful waterfall. Sticky and sweaty, we all dive in immediately. The water is cold but so refreshing! A perfect place to picnic and eat our delicious lunch made by the guesthouse we slept last night. With renewed energy we hike back up the steep stairs… And down the other side… And up again to our guesthouse… When we arrive, I fall into a chair and don’t get up until I drag myself to bed and fall asleep within seconds. Download all the information (including a packing list) about hiking in Banaue and Batad below. This post has been updated in December 2018. Beautiful! Isn’t it funny how locals always seem to run around on their flipflops while we are struggling to keep up with them in our hiking shoes or trainers? How do we book for the guide and accommodation? Thanks! We arranged the 3 day hiking tour (including the guide and accommodation) when we arrived in Banaue with the night bus. If you travel from Manila to Banaue by night bus there will be plenty other travelers around, so talk to people on the bus and find out about their (and your) travel plans to see if they overlap. When you arrive in Banaue you can find a guide together with people who also want to go hiking and split the costs (for the guide, jeepney, etc). You can also find hiking packages online which you can book in advance but I don’t have any personal experience with any of those. What a cool experience! This definitely sounds like a hike we would be interested in doing. I would love to see the rice terraces–the scenery looks so gorgeous there and I bet the waterfall was super refreshing for a swim after all that hiking! Thank you Ron! It was a once in a lifetime experience:-) Would love to go to Sapa one day, I skipped it during my last trip to Vietnam, but maybe I’ll get to visit somewhere in the future… Rice terraces are amazing! This looks amazing. Quick question, I’m travelling solo should I try and book a tour in advance or is it safe enough to try join a tour when I arrive in Banaue? Hi Theresa, very cool you are going to Banaue, it’s so beautiful! I definitely think it’s safe to join a tour when you arrive in Banaue. If you arrive by night bus there will be plenty other travelers around, some you may have even talked to already on the bus (which takes quite long so lots of time to meet people and talk to them about their plans… And yours;-). Let me know if you have more questions and have a great trip! Very welcome:-) Have a great trip! Hi Lotte, This sounds amazing! Do you know if it is possible to pre-book a guided tour similar to your’s? And if so, do you maybe have some contact information, web address etc you can share? 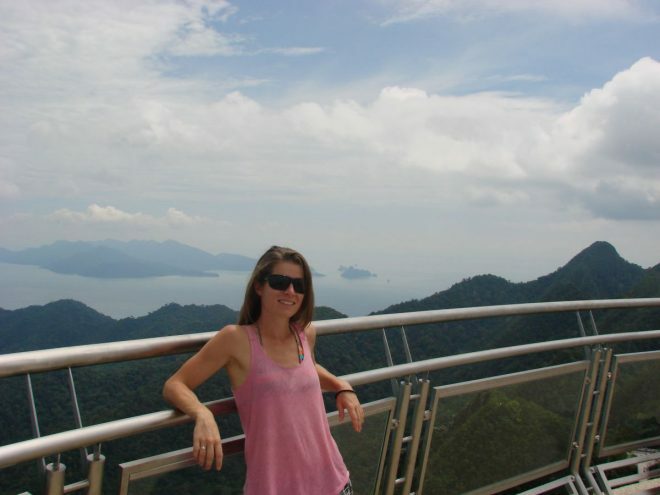 Hey Kristine, it was amazing and I can definitely recommend doing this hike! There are similar packages available online, for example on http://www.e-philippines.com.ph/ but I have no personal experiences with them so I don’t know about their terms & conditions, customer service, etc. Thanks so much for the quick reply! I will try to contact them and see what they can offer. Otherwise, did you find it easy to find the guided tour upon arrival in Banaue? You are very welcome Kristine:-). I found it very easy to arrange the tour upon arrival, from the night bus station in Banaue we were taken to a restaurant and there were people from a tour company offering a lot of different options. I recommend asking other travelers about their plans (you have plenty of time for that on the night bus;-) and form a group so you negotiate a bit on the price. Hi Lotte, I’m planning a trip to Banaue this christmas! Thanks for the awesome information, wow, it even includes an interactive map! I was wondering, do you think it’s possible to do the trip in two days? For example, day 1 starting point on your map to Cambulo. Day 2: Cambulo to ohayami bus station? We booked our bus for Day 2, 9pm. maybe the bus will be late haha. Just to give some background so you can gauge, we’re fit people who regularly hike long distances, for many days at a time. I would appreciate your advice! thank you Lotte! Regarding your question: the distance can be covered in 2 days (day 1 Banaue to Cambulo, day 2 Cambulo – Batad – Banaue). However, most hiking tours are 3 days. Perhaps it will be possible to find a guide willing to do the hike with you in 2 days. I suggest asking around town when you arrive in Banaue. Having a guide is crucial, the route through the rice paddies isn’t something you can find on your own;-). Enjoy your trip and let me know if you have any other questions! I am glad that I landed on your blog with such details of the hiking trip. A great help for me to plan my trip. Loved your post! Were you alone and then met up with a group? Just wondering how easy it is to find a group. And do you remember what company you used? Hoping to go next week! Also what time of year did you go? – I was traveling with my husband. – We met up with a group once we were in Banaue, these people were traveling on the same bus. We found it easy to form a group with fellow travelers as there were many people whose sole purpose in Banaue was to do a trekking. – I honestly don’t remember the name of the company… I’m sorry! Just make sure you make a list (on paper) of the things that are included (guide, transport and accommodation) and the things that are not included (in our case water and food) and confirm with the person selling the package if you understood correctly. Enjoy your hike! 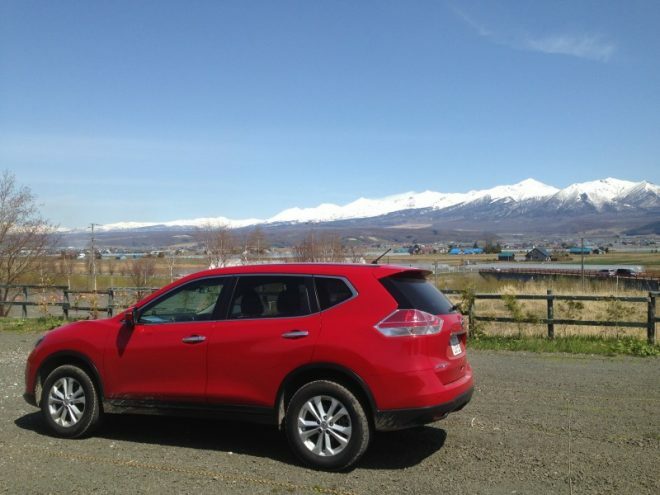 The scenery is gorgeous and it’s the perfect way to disconnect as there is no WiFi at all (at least there wasn’t when we visited, but that was in February 2015. Things may have chancged;-). That is a very cool trip. I would love to do something similar. Do you remember the name of the place where you stayed in Cambulo? Thanks, it was an amazing experience! The place in Cambulo didn’t have an official name and can’t be found on internet. But when you book a hike in Banaue the guides will arrange accommodation along the trek. Do you remember the name of the group with whom you booked the hike tour? Hi Jojo, I’m sorry but I don’t remember the name of the company. But you can easily arrange a tour once you have arrived in Banaue. If you travel there by night bus there will be many fellow backpackers around, I recommend talking to them to ask if they are also interested in doing a hiking tour and try to find one together. Enjoy your trip! Just to thank you for this post. I just got back from Batad, and trekked on my own. While I did not use any trekking tour, I found your experience pretty interesting and useful.